Yes, I admit it. 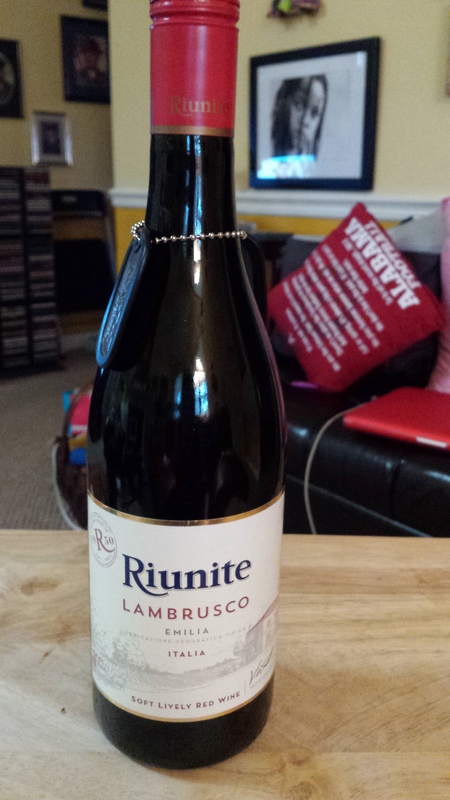 I went to the grocery store and bought a bottle Riunite Lambrusco on purpose. It fits my criteria, it’s wine and it’s under $10. I had a plan. I was cooking my world-famous-if-even-in-my-own-mind chili. It is incredibly spicy (thanks to a little Scorned Woman hot sauce). And yes, that is the real name of the condiment. I bought in the Charlotte airport many years ago because I loved the name. I had no idea that it would become a staple with my family. And yes, it is hot. Anyway, I wanted a light red wine to serve with chili. I needed something a bit on the sweeter side (but not a moscato). I am not a wine snob, but just cannot stomach the moscato wines that I have sampled. Maybe, just maybe I have not found the one. Maybe, and I am okay with that. I was too lazy and cold (in some places 30 degrees is actually considered cold even if you are not naked) to go to Trader Joe’s to find a wine in my price range. So I walked (I needed Fitbit steps) to the nearest grocery store and bought the wine. Lambrusco is grown in the Emilia-Romagna region in northern Italy. So, it is actually an Italian wine. The wine varietals are over 2,000 years old. Who knew? Lambrusco was the favorite of Augustus Caesar’s second wife. Who knew? I think there are other and perhaps better Lambrusco wines, but I did not see any in the grocery store. I paid $6.99 on my bottle. Let me describe it in my limited wine specialist vocabulary: not acidic, not tannic, medium bodied, sweet (but not cloying so), medium finish (did not last long on my tongue, but did not disappear too quickly), it was pleasant, and not complex. This gives it the ability to go with many foods. I found it a delightful wine, however I prefer a wine a bit more complexity.